The Herb Gardener: Jerky for the Stocking -- Oh, Yeah! Jerky for the Stocking -- Oh, Yeah! If you're still stumped about what to get the man in your life for Christmas, there's always -- meat. Yes, most men (and many women) like a little jerky under the tree or in their stocking. Really. You may not like the price of the packaged stuff, but if you have a dehydrator, making an easy, portable meat treat for the man in your life is pretty easy. The price of beef is high, but maybe no higher than spending the money on another man wallet or reversible belt. A roast destined for jerky goes a long way, too. The salt in the soy acts as a preservative (and draws out the water from the meat fibers), and the sugar and spices add flavor. 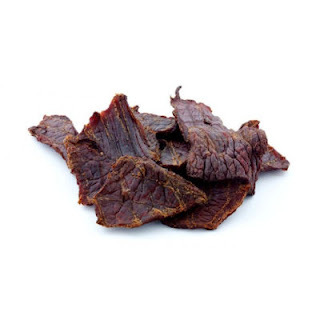 You can easily make jerky from lean rump roast, sirloin tip roast, round steak or flat steak. You can also make it from turkey (breast). The trick is to slice the meat thin. Partially freezing it helps (less wiggle). It should be about as thin as a slice of bacon. You can also ask your butcher to slice a roast for you. Just explain what you plan on doing with it and he (or she) will understand. If not, a cut that's about an eighth-inch (1/8") thick should do it. Tip: I try to head out to the market early so I can catch the butcher before he gets too busy. Most jerky will dry in less than 24 hours -- after a brief stint in a soy marinade, which means you can make a big batch in a little over a day. The dehydrator does all the hard work. I've made lots of holiday treats over the years, but jerky is probably the one that friends and family have asked for the most often. It doesn't look like much, but don't knock the homey fun of gnawing on a strip of jerky while watching a classic movie on the old flat screen. It's as good as flavored popcorn and a lot more filling. It's a sure bet that this is a homemade present he won't be expecting in his stocking. Ho ho ho.